Historic Building Information Modelling (HBIM) is a new approach for modelling historic buildings which develops full Building Information Models (BIMs) from remotely sensed data. HBIM consists of a novel library of reusable parametric objects, based on historic architectural data and a system for mapping theses library objects to survey data. This chapter describes the development of a library of parametric objects for HBIM that can be used to model classical architectural elements. Steps towards automating the HBIM process are also described in this chapter. Using concepts from procedural modelling, a new set of rules and algorithms have been developed to automatically combine HBIM library objects and generate different building arrangements by altering parameters. This is a semi-automatic process where the required building structure and objects are first automatically generated and then refined to match survey data. The use of procedural modelling techniques with HBIM library objects introduces automation and speeds up the slow process of plotting library objects to survey data. In the architecture, engineering and construction (AEC) sector and among heritage communities there is increased importance on modelling, documenting and representing buildings with intelligent information enhanced models as opposed to previous digital representations that contained only geometry. The main motivation for smart information enhanced models is the wide variety of applications that the information rich models can be used for. This includes applications for documentation and management of buildings along with great capabilities for energy, structural and economic analysis of buildings. The concept of Building Information Modelling (BIM) is a major development in 3D CAD modelling and provides the ability to represent buildings with smart information enhanced components. BIM incorporates object oriented, parametric and feature based modelling concepts combined with the addition of a dynamic 3D database for storing information relating to buildings. Due to its many benefits, BIM has received a lot of attention in both industry and academia. As BIM was designed for modelling and representing new and modern buildings the focus of this attention to date has mainly been on the use of BIM in the planning, design and construction stages of a building (Volk, Stengel, & Schultmann, 2014). Recently however there has been a shift in BIM related research from early life cycle stages to maintenance, refurbishment and management of buildings throughout their complete lifecycle (Volk et al., 2014). The benefits of BIM make it a very suitable solution for modelling and managing information relating to a building after the construction stages and throughout a buildings lifecycle. A BIM for an existing or historical building can be used as a documentation tool for conservation work, retrofitting, renovations or as a tool for performing building analysis. The use of BIM for managing buildings after construction stages require the condition of a building to be accurately recorded after a building has been constructed (as-built) or a current condition of a building (as-is). The term “as-built BIM” is being adopted to include both an as-built or as-is representations of a building with BIM (Tang, Huber, Akinci, Lipmand, & Lytle, 2010). Hichri, Stefani, Luca, and Veron (2013) define an as-built BIM as a building described with a BIM representation at the moment of survey. The creation of an as-built BIM or HBIM requires accurate measurements to be taken on a building which can be used to create a 3D BIM representation. This data can be collected using laser scanning, photogrammetry or other traditional survey technologies. The current problem with these technologies is that they produce very large unstructured datasets such as 3D point clouds that need to be converted to structured 3D models for useful further applications. 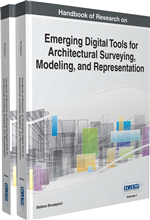 The creation of an as-built BIM from survey data can be divided into three main stages. This includes data acquisition, pre-processing of survey data and 3D modelling with BIM. The third stage of modelling with BIM is the longest stage of an as-built BIM project. This is a reverse engineering process where BIM components are created and mapped to the survey data to create the BIM model. The automatic generation of structured BIMs from point clouds is a primary focus for a lot of research in the area of as-built BIM. Although progress has been made in this area (Jung et al., 2014; Xiong, Adan, Akinci, & Huber, 2013; Zhang & Zakhor, 2014), the automatic generation of BIMs from point clouds is still an unsolved problem. As a result the current practice for creating as-built BIMs requires manual modelling techniques which can be time consuming, labour-intensive, tedious and requiring skilled workers (Tang et al., 2010). Because BIM is mainly used for design of new buildings, commercial software is also currently limited with tools for modelling complex architectural elements and irregular geometries that often occur in existing buildings due to deformation and damages over time. The time consuming and tedious nature of the as-built BIM process motivates the need for new more automated solutions designed specifically for modelling existing and historical buildings from survey data. Shape Grammar: A production system used in procedural modelling which comprises of a set of basic vocabulary shapes and a set of production rules used to transform shapes to create 3D content. API: Application Programming Interface, a set of functions and procedures that allow for the creation of applications which access the features or data of an operating system, application, or other service. Parametric Modelling: A method of geometric modelling where features or objects are defined using parameters that can instantly alter the geometry of an object. Simple parameters may include the width, length or height of an object. CityGML: City Geographic Markup Language, a standard international data format for representing 3D urban objects which includes geometrical, topological, semantical, and appearance properties. Photogrammetry: The use of photography in surveying and mapping to ascertain measurements between objects. GDL: Geometric Description Language, a programming language for creating parametric objects within ArchiCAD BIM software. IFC: Industry Foundation Classes, an international open standard for Building Information Modelling. GIS: Geographic Information System, a computer system designed to capture, store, manipulate, analyse, manage, and present all types of spatial or geographical data. As-Is: Current documentation of a building or structure at a particular time. As-Built BIM: A building described with a BIM representation at the moment of survey. Can include both an as-built or as-is representations of a building with BIM. TLS: Terrestrial Laser Scanner, an active scanner that uses laser light and photography to capture detailed and highly accurate information relating to an object’s dimensions, spatial positioning, texture and colour in three dimensions. CGA: Computer Generated Architecture, a shape grammar used within the CityEngine software to generate architectural 3D content. Procedural Modelling: An automated approach to generating 3D geometries based on a sequence of generation instructions, rules or algorithms that can be repeated with varying characteristics. As-Built: Documentation of a building or structure after it is built. HBIM: Historic Building Information Modelling, a system for modelling historic structures from laser scan and photogrammetric data using Building Information Modelling (BIM) software. BIM: Building Information Modelling, A digital representation of physical and functional characteristics of a facility.